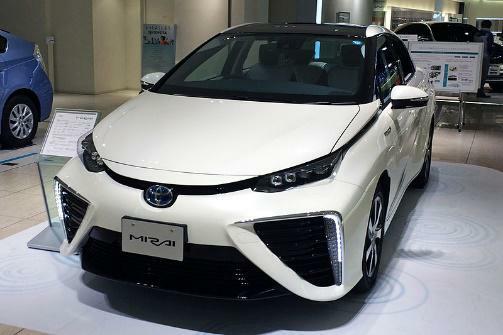 Toyota has been working on hydrogen-fueled cars since 1992. In 2014, they announced the development a highly functional, nonpolluting car, called the Mirai (future), powered by hydrogen fuel cells. The only emission would be clean water. They also stated hydrogen was the most abundant material in the universe. They, however, failed to mention there is very little free hydrogen available on the planet. Having one proton, and orbited by one or two electrons, hydrogen is the lightest of all gases, and floats to the upper atmosphere, where it then moves to the vacuum of space. This has been a long term problem for the hydrogen fuel cell industry. While hydrogen can be released from other materials, invariably carbon dioxide is also released during the separation process. Historically, processing hydrogen from other materials has been costly and has produced large amounts of pollutants, making it a poor alternative energy resource. Currently, for purposes of transportation, electric cars and trucks are much more efficient. The biggest problem for Toyota is fueling the car. Where does one purchase hydrogen? On the east coast there is one hydrogen filling station in Connecticut, called SunHydro, where the hydrogen is separated by way of solar energy. In California, where hydrogen fueled vehicles are much more common, there are 9 hydrogen fueling stations across the state, (though 20 more are planned for 2015, and another 20 for 2016). Hydrogen fueling stations would need to be built across the nation, possibly combining with the current gas stations. The question then becomes, why is Toyota investing in fuel cells when, at present, batteries do a better job, and the technology is cleaner? In part, it is because Toyota believes lithium-ion batteries are nearly maxed out, in terms of its technological evolution. The potential for new hydrogen fuel cell technology, on the other hand, is wide open. Toyota also believes their business model for fuel cells is very sensible. This is because their business model is fairly similar to the one used for internal combustion engines. As with internal combustion engines, fuel cell technology will be manufactured in-house by automakers. Batteries, on the other hand, are bought from outside suppliers, or manufactured in joint ventures. While it is true building a national hydrogen distribution system will be expensive, these filling stations will look almost like today’s gas stations, providing a certain level of cultural comfort. Toyota has also indicated it has “additional long term plans” for hydrogen power. They have, for example, made all the 5680 patents on their hydrogen cell technology free and available to the public (very unusual). They have also made the statement, “A fully fueled vehicle can provide enough electricity to meet the daily needs of an average Japanese home (10 kWh) for more than one week” (a little odd). Both behaviors suggest plans for large scale changes in the way electricity is produced. After water dams fell out of favor as a means of generating electricity, coal became the traditional fuel of choice to accomplish this task. While coal is fairly cheap, just as with hydrogen power, it is also a major source of air pollution. This is how we currently get electricity for our lithium-ion battery powered cars, and our homes. Not significantly better than gasoline powered cars. Enter Proton Power, Inc. Proton Power, Inc. was the winner of the Innovator Award at the 2015 Pinnacle Business Awards from the Knoxville Chamber of Commerce. Proton Power has developed technology capable of producing hydrogen, from biomass, on demand, and which is significantly more efficient than other systems. Their technology achieves a 65 percent gas output, which is well above the industry average of 15 percent. The heating value of hydrogen produced by Power Proton's technology is 230 BTUs per standard cubic foot of gas versus the industry average of 150 BTUs. Proton Power's technology provides on demand hydrogen, eliminating the need for storage and distribution systems. But there is one additional benefit. Their process creates biochar. Biochar is carbon in a solid form. Instead of releasing carbon into the atmosphere as greenhouse gases, their system captures the carbon, storing it in solid form. The biochar can be used as a soil additive to increase crop yields by up to 150 percent or more. (“We planted tomatoes and conducted our own tests and saw a 300 percent yield increase,” Wampler, a sausage manufacturer using the equipment stated.) Proton Power, located in Lenoir City, Tennessee, has provided an environmentally-friendly solution to hydrogen waste disposal. For businesses with large electrical needs, such as Wampler’s Farm Sausage, the new hydrogen technology can mean a huge savings in production costs. It is hoped the technology will eventually “take us to a zero electric bill and we should wind up with a total energy cost that’s 25 percent of what it was when you factor in what we pay for the biomass,” said Ted Wampler. In the last few years, people in the power industry have become aware of Proton Power. Word has spread of the technology’s effectiveness. In February 2015, business officials from six different Eastern European countries toured the Power Proton installation at Wampler’s Farm Sausage, including representatives from Russia and Ukraine. Proton Power, Inc. currently has a customer in Singapore, and officials from the Philippines have also visited. It will be interesting to see how this all fits together over the next few years. Keith is a physicist with a back ground writing on physics and alt energy and has many white papers published. He is also a published sci-fi writer.